Diorama Backdrop - Duke Street. I am working on laying out the Virginia Locomotive and Car Works (VL&CW), also known as Smith and Perkins. The Railroad Gazette article in the link below gives a description of some of the engines that they produced. There is sufficient information in that article to build a model of a one of their locomotives. 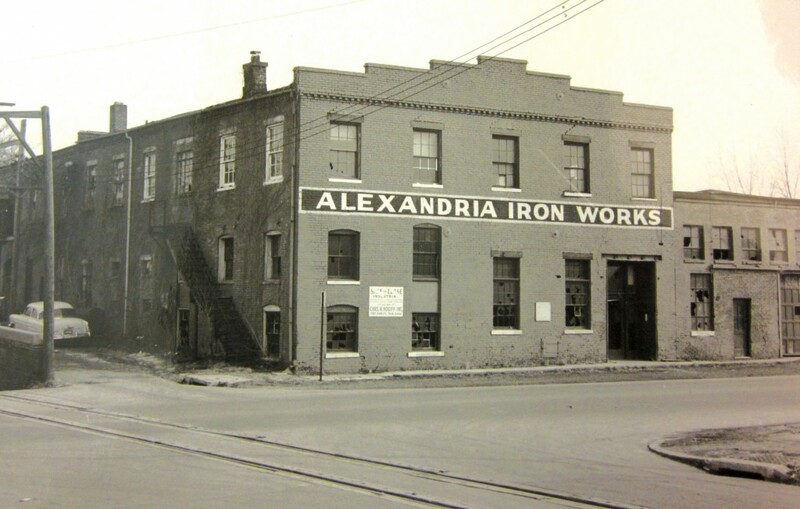 However, at this time I am focused more on their physical plant that existed in Alexandria in 1855. And herein lies the problem. The information I have is incomplete and has discrepancies that are hard to reconcile. 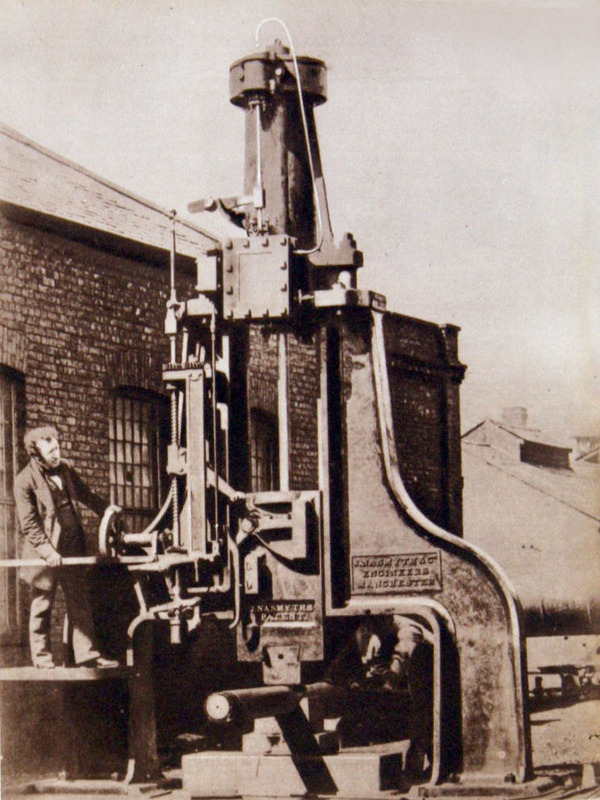 Locomotive manufacturing on the scale carried on by Smith and Perkins could not be confined to cramped quarters. In 1854 their locomotive plant on Wolfe Street covered 51,500 square feet of ground and fronted 177 feet on the Potomac River. 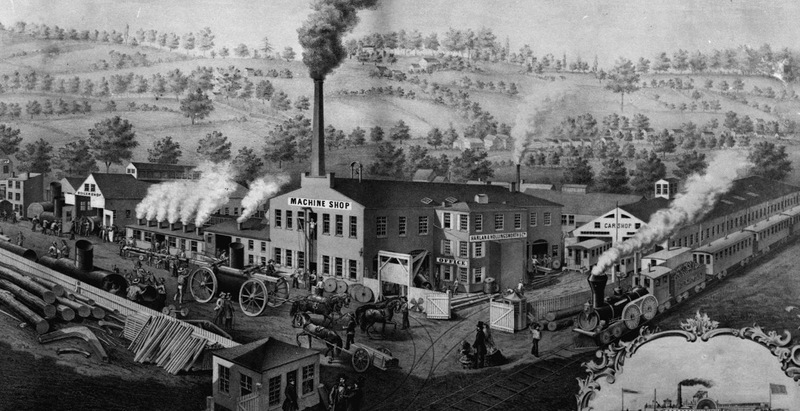 The principal machine shop was a three-story building 130 x 35 feet. On the first floor were three tracks for setting up engines. The same floor housed the tool shop with its facing and other lathes, drilling machines, bolt cutting machines, a slotting machine, and large planer and boring machine for ''turning" car wheels. machine shop. The third floor was used for another machine shop and as a pattern loft. 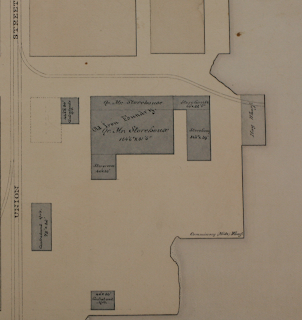 The "fitting up and finishing shop" on the site of the old foundry was 81 x 60 feet. Two locomotive engines could be "fitted up" at one time upon its tracks. The 100 x 36-foot blacksmith shop had 15 fires and one of "Nasmytherspowerful steam" hammers. The boiler shop was 100 x 40, and the four-track car shop 150 x 40. 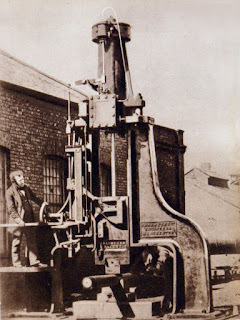 The plant had circular and upright saws, tools for punching and shearing iron, and the equipment required for planing, mortising, and tenoning wood. The 100 x 60-foot foundry on Wilkes Street held two furnaces for melting pig iron and a 27-horsepower engine for driving the fan. In 1854 it produced two and a half to four tons of castings daily, but it was capable of a maximum production of &om ten to twelve tons. The plant consumed annually 1 ,200 tons of Cumberland coal, 250 tons of anthracite, 900 to 1 ,200 tons of pig iron, and 650 tons of bar and boiler iron. It employed approximately 225 workers. The general superintendent was Thomas Denmead, who had been superintendent of the Baltimore and Ohio Railroad shops at Martinsburg. Principal machine shop - 130 by 35 feet 3 story with three tracks for erecting engines. Fitting up and finishing shop - 81 by 60 feet with two tracks. Blacksmith Shop - 100 by 36 with 15 fires and a Nasmyther steam hammer. Boiler shop - 100 by 40 feet. Car Shop - 150 by 40 with four tracks. Foundry - 100 by 60 feet with two furnaces on Wilkes Street. 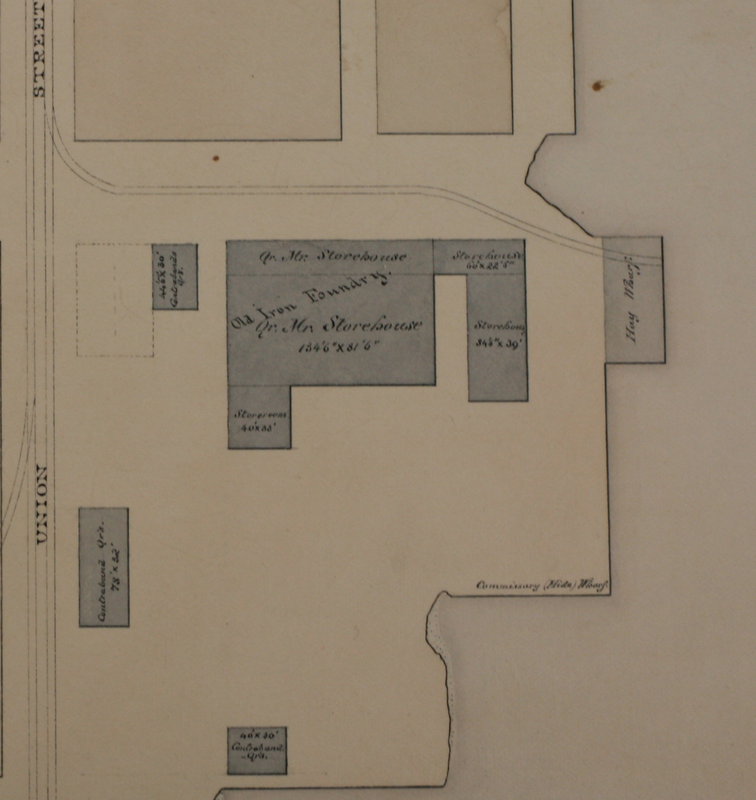 I have not found any good drawings of the VL&CW facility in 1855. The two drawings I do have date from the Civil War, from 3-8 years after the works closed down. These are the Bird's Eye View and the Quartermaster map. It is interesting that the Bird's Eye View and the QM map do somewhat agree in depicting the buildings on Wolfe Street. The QM map gives dimensions of the buildings that they used in the war. It shows three interconnected buildings and a few smaller buildings used for Contraband quarters. Note that the QM map does not show buildings that Army did not use during the war. So it is possible there were other structures present that the draftsman left out. More importantly, the QM map shows one railroad siding, while the Bird's Eye shows none. 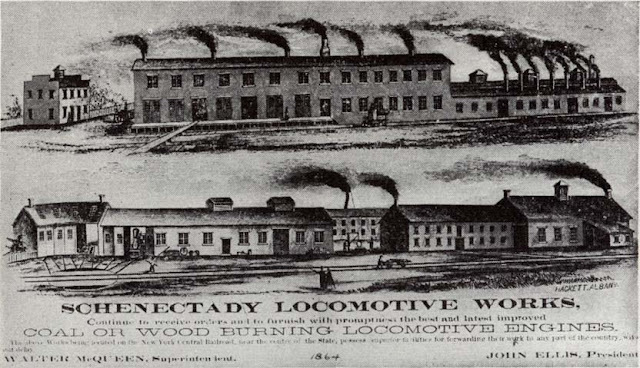 Quentzal describes three buildings with tracks for erecting cars and locos. The early 19th century drawing of the Harlan and Hollingsworth works gives some clues. Note how the car works building on the right shows two tracks entering the end of a long wooden building. But, note that a single siding runs parallel to the machine shop and no tracks enter the shop. Workers are using push carts and wooden wagons to move boilers and other objects around. Some people are working in the open air on boiler parts. The second view showing Schenectady Locomotive Works depicts similar activity. 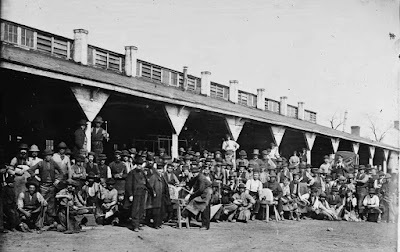 I suspect it wasn't until locomotives became too heavy to move around on carts and trolleys that the factories started building the engines directly on the rails. I assume that similar construction procedures were used at Virginia Locomotive and Car Works. I think that the erecting tracks were not connected to the railroad directly. Once the engines were assembled, they used carts to move the finished products to the departure tracks. There is a photo of the foundry on Wilkes Street as the building survived until late in the 20th century. The attached drawing shows my best guess at mapping the buildings described in Quentzel's article to the QM map using a lot of educated guess work. Everything is drawn to scale. The large yellow box shows an area of 51,500 square feet if one side of the box is 177 feet. There was no way to reasonably connect tracks to the Old Foundry to the siding shown on the QM map without 30 ft or less radius curves (see curve A). That would equate to a 2.26 inch radius in N scale. That is impossibly tight. So I suspect the erecting tracks were not directly connected to the Wolfe Street Siding. I replicated the car works from H&H to the VL&CW facility. I made it a separate building as there was no way the five buildings Quentzel describes would fit in the outline of the buildings on the QM map. I have a photo of a large blacksmith shop in Washington DC. It is a wood building. If such a building was in Alexandria, it is possible it did not survive for ten years after closing. Blacksmith shop in Washington DC during the Civil War. If anyone has any additional information, I would love to see it. This shot is one of my all time favorites model railroad photos. I shot it for my book, "Model Railroads Go to War." Alas, the printed version really does not do it justice since a CMYK print doesn't have the dynamic range to render the dark clouds and shadows properly. But on screen, the image pops. The loco is a ROD Robinson 2-8-0 that Chris Williams let me borrow for the shoot. The flat cars are Macaw bogey wagons that I scratch built. at www.AlkemScaleModels.com for a signed copy. I finished the second portion of the backdrop tonight. This part of the backdrop depicts Wolfe Street. I didn't have any good prototype images showing what buildings look like in this area, so I relied on the Bird's Eye view. I drew the structures in Adobe Illustrator and composited the scene in Photoshop. I added the slight hill that leads to Lee Street. Once it was printed and cut out, I added finer texture such as grass, weed, ruts using pencils, water colors, and acrylic paint. Using a piece of flex track to mock up the loco works siding. The actual siding will be hand land on wood ties. The last remaining backdrop task is to paint the loco works railroad siding on the backdrop as it heads to Union Street. The test image below shows approximately where it will be. The final placement will wait until I get the actual track installed. This is a very tricky backdrop interface to paint. I've done this once before and it works well, but only from one viewpoint- straight in. So one needs to use view blocks to prevent looking at the interface from oblique angles. Laser Cut Pieces - No Mistakes! I also started building the loco works. Again, there are no good photos except the Bird's Eye view. 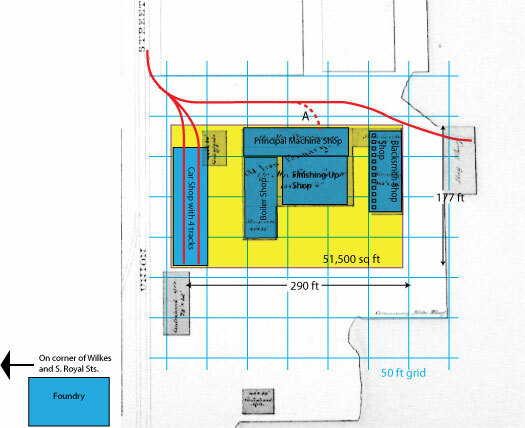 The ACW era QM Map shows the dimensions of the building's footprint, but no other data. Using those dimensions and the Bird's Eye view, I drew up this plan. In a laser cutting first for me, the first draft of the building had no mistakes. Maybe I should buy a lottery ticket! I quickly glued the parts together to see how it fits. I plan to use texture paper to add the bricks to this building. We'll see how that goes. Photo panorama made by Wally Owen, former Asst Dir/Curator Ft Ward Museum. The backdrop for the Alexandria Antebellum diorama presents several challenges. First is that there are only a couple of photos showing the area we are representing. The best image we have is a view to the northwest from the top of Pioneer Mills. It only shows about a third of the area we need to show in the backdrop. Also, there are no views closer to ground level. I want the backdrop to have a ground level versus aerial perspective as I find that works better in model scenes, especially when taking photos. The last major challenge is that there are two streets that intersect at 90 degrees to the backdrop. These are some the most challenging backdrop-3D terrain interfaces to have to deal with. The following are step-by-step photos showing the backdrop process. The backdrop received 3 coats f Gesso primer applied with a roller. I sanded it smooth in-between coats. The cut and primed backdrop screwed to the diorama. I tried a couple different ideas to depict Duke Street and the buildings behind the mill. In the end, I decided to draw the scene in Adobe Illustrator. I use AI perspective grid feature to create the vanishing point and help draw the buildings receding into the distance. I spent more time than necessary detailing these distant buildings, when in the end they are very tiny on the backdrop. The two main buildings in the front of the backdrop came out really nice. The large brick building is the coopering house where they made the barrels to ship out the flour. The three sheds on the right are for an unknown purpose, but we had a decent view of them in prototype photo. So I was able to represent them pretty well. I used actual brick and siding textures to embellish them. That worked surprisingly well. One the backdrop was printed on 11x19 inch paper, I added two sided tape film to the rear. Then I trimmed the image using a X Acto knife. I touched up the edges with a dark green marker. I used watercolor pencils to add some texture and shadows to the structures and street. Then I installed it on the back drop. That is 19 of of 43 inches total need. Just a little less than half way. Finished model schooner in Alicia's hand. The schooner will be positioned by the (almost finished) mill. 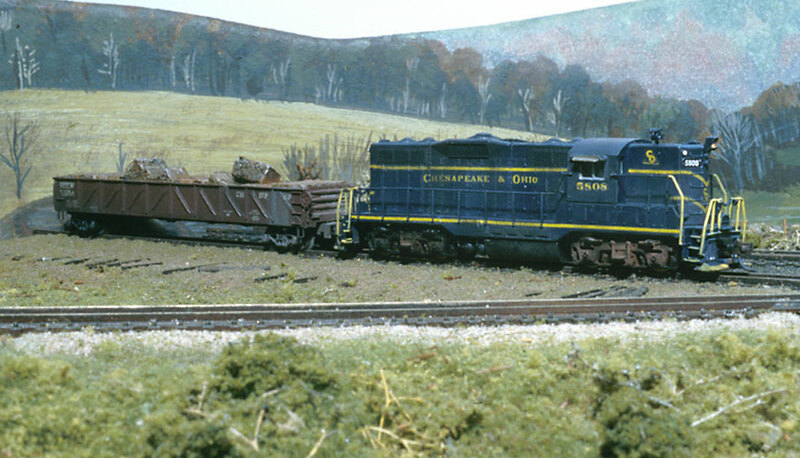 forward to working on the O Scale ships for the Aquia Line. Scratch built anchor with a chain. It's been snowing for the past 27 hours and more is expected - a perfect opportunity to get some modeling done. I finished up the rigging. Added the skiff and davits to the rear and an anchor. I hit the model with dullcote to hide shiny glue spots. I used my airbrush to apply the dullcote instead of a can as, I didn't want to get lacquer on the lines for fear that they may loosen. I noticed that acrylic matte varnish on the lines did cause them to become slack. Now, on to the rest of the diorama. Oh yeah, it has been snowing here. No, this is not a new class offered at the local college, it means I have been working on the rigging for the schooner on the museum diorama. This model is N scale, which means the rigging will have to be simplified, as all the components are tiny. As one ship modeling book I read said, "ship blocks were made to fit human hands, so they are very small when scaled down." This is very true, especially in N Scale. If I were do make the blocks and deadeyes to scale they would be about 0.020-0.030 inches in diameter. Instead of reinventing the wheel in trying to figure out how to make the blocks, I ordered some 2mm blocks from Syren Ship Model Company. These are the smallest blocks they offer. The owner of the company, Chuck Passaro, is an accomplished ship modeler. Check his web site for examples of absolutely exquisite examples of ship models. While I was on his site, I ordered some 0.008 inch rigging thread. When the blocks arrived I was dumbfounded. They are so tiny, yet they include two holes for lines and a groove around the circumference for the strops. Wow! Now the challenge is to thread them and install on the ship model. Tying the block to a boom. I have to use three hands, a vise, forceps, and pointy tweezers to thread these blocks. But it is doable. So far I have completed about half of the blocks I will need for this model. The deadeyes and ratlines were another challenge. In this scale, these was no way I could actually rig the deadeyes with 3 lanyards per set. So I used the laser to cut stylized deadeyes with the lanyards included. But even that had to be simplified as true scale lanyards were too fine to laser cut. After 4 tries, I ended up with some nice looking deadeyes. I am going to omit the ratlines as I don't think I can make them neat enough to look good. Also, they should be thinner line than the shrouds they are attached to, but I am already using my finest thread for the shrouds. to allow clearance for the marine leg from the mill. To make the sails I used some tissue paper that was inside an HO Scale Accurail car kit. It is thin with very fine texture, but seems to be able to survive the handling necessary to make it look like they are furled on the booms. All this fine N scale work is getting me psyched to try a pungy schooner in O Scale for the Aquia Line layout. With the components 4 times bigger, it should be a fun project and much closer to scale. Work progresses on the Pungy for the museum diorama. I finished most of the hull including the wheel, cabin, hatches, anchor winch, and bowsprit. The job is taking much longer than I expected for two main reasons. One is that I don't have a lot of experience in building schooners, so I need to look up and verify each part. The plans I have are good, but they don't show a lot of detail. Secondly, the peewee size of the model has both complicated and simplified the construction. For example, the bowsprit has several detail pieces that connect the boom to the clipper bow. I pondered how to make them, drawing up detailed versions on the computer. But when I realized how small the actual parts were, a single laser cut piece was all that was needed. The masts are less that 1/8th inch in diameter. To get the proper tapered profile, I used my lathe with the steady rest. That worked pretty well, though I did break a couple masts as I sanded them to final shape. They are not much thicker than toothpicks. Now the challenge is to rig the model in reasonable way that is close to scale. Mike Spoor and his boss, Maj CJ stopped by tonight to put the PoLA layout through an operational test. They are Army guys in town for military training at Joint Base Anacostia- Bolling (formerly know as Bolling Air Force Base.) Mike has been here many times before. CJ is not a train guy, but he enjoyed seeing the layout. This op session had nearly a full load of cars with 27 cars being switched in or out. This a copy of the switch list they used. There also about 10 cars on the layout that did not get switched. The session included some new cars that literally came out of their boxes tonight. Some of those cars had coupler issues and some tuning will be necessary. Mike did most of the model RR work while CJ and I BS'ed. We had fun comparing stories from our Army service. The Army today is much different from when I was in as nearly everyone now has combat experience. Being a cold war veteran in NATO in the early 1980s, my combat happened in German Gasthauses, Alpine ski slopes, and in the sport cars on the autobahn. In retrospect it was a fun time. Today things are much more serious. Service members today deserve a lot of respect. Some observations on the op session. The layout easily handled this number of cars. Although we only ran one train, there was room in staging and on the layout for a second train (to be run sequentially, not simultaneously). With each train taking over an hour to switch, a full op session could take 2-3 hours with two trains. One of the turnouts was causing trouble. It never acts up when I operate, but seems to be pesky when Mike operates. Not sure what the problem with it is. More testing is required. We also ran the Civil War layout briefly to demonstrate some of its unique features. CJ got to run the McCallum, which he seemed to enjoy. Gerry Fitzgerald alerted me to a new video that the NMRA has produced. It is an introduction to the hobby and the NMRA. I believe Gerry Leone was the main force behind the video (all these Gerrys are confusing) since Gerry L. asked me for my permission to record a portion of one of my clinics at the Portland NMRA. Rumor has it that I am in the NMRA video at some point. And yes, the camera does add 10 pounds and 10 years. Norm Wolf and I had fun tonight. We did live on-line photo tutorial tonight using Skype's shared screen feature. Norm lives about 4 hours drive from me. 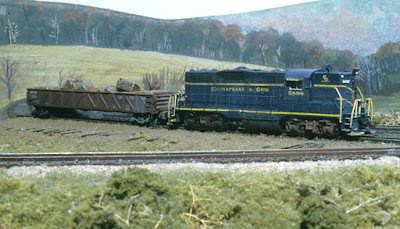 Norm took some images of his switching layout. 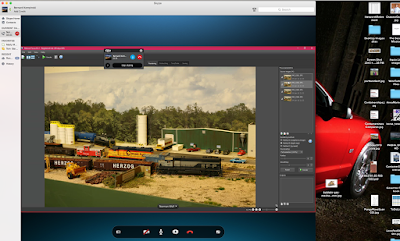 Then using Helicon Focus and Photoshop Elements he was able to sharpen, retouch, and crop the image. My screen view of the "before image"
Here is what the session looked like from my end. By watching his screen I was able to coach him and explain various concepts while he did the actual photo manipulations. It was fun for both of us. BTW this is the 700th post on this blog. Wow! According to Geoffrey M. Footner, in his book "Tidewater Triumph: The Development and Worldwide Success of the Chesapeake Bay Pilot Schooner," the following images show pungies under construction or repair in Alexandria during the civil war. 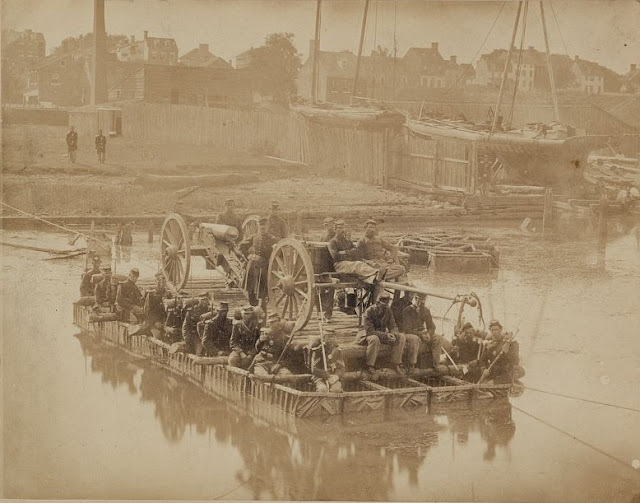 The photos are intended to show tests of Herman's Haupt's infantry arks made from rubber (gum) blankets and wood frames. But, in the right background you can see ships on marine ways at the Alexandria shipyard. There wasn't room on the diorama to show the shipyard, but we can show a pungy at the wharf at Pioneer Mills unloading bulk wheat via the marine leg. These are also the best views I can find of the Alexandria waterfront looking west during war time Alexandria. Great start to the new year - my first career eagle today! But enough golf talk, this is model railroad blog. This afternoon I took advantage of the nice weather to move the wood working tools outside to build the diorama base. We stopped at Home Depot after celebrating the eagle at Sweetwater, ...wait I thought you weren't going to talk about golf. Oh yeah, no more talk about that eagle. The diorama will be on a pedestal made from birch plywood and molding trim. The trim is not glued on but secured from the inside to an internal frame I made from 1x2s. That way I can modify the frame and trim if the museum deems it necessary. I also started work on the schooner for the diorama. This will be a pungy style schooner. The ship yard in Alexandria made pungies as well as other type of sailing ships and barges. 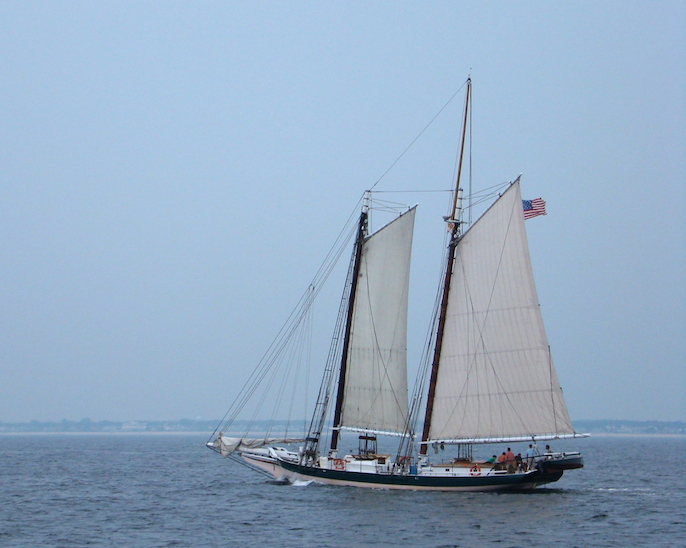 The prototype for the model is the Wave, a 56 ft schooner. It was built in 1863 in Accomack Va, but is similar to Alexandria-built pungies. The Wave survived for quiet some time and plans are available for it. 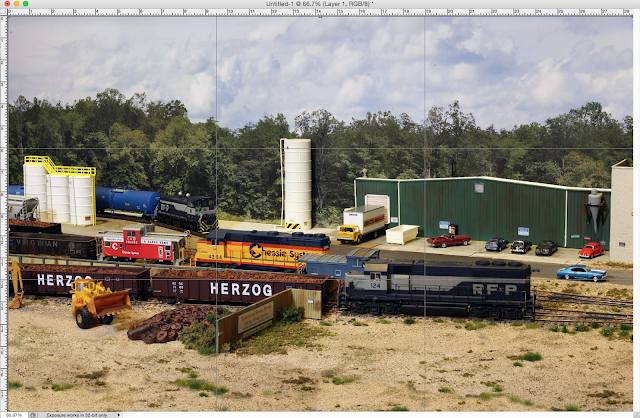 It took some time for my O scale calibrated eyeballs to get accustomed to working in N scale again. I built the hull using the bread and butter technique. I used my laser to cut the slices of bread.I laminated them with yellow glue. Then I sanded the edges until I got the right shape. Then I added a laser engraved deck and transom. I stained it a dark brown to show it is a well used work boat. Pungies are traditionally painted pink and green, but I may opt for a simple gray paint. It is a cute boat, but I think I will rename it, "Eagle."